A while ago I watched a cooking program (Restaurant: Impossible) where a family business was being torn apart by sibling rivalry and marital discord. The chef (Robert Irvine) who was wheeled in to fix this situation made a comment that stuck with me. He got to the heart of the matter by pointing out that “the love” was missing from the cooking. I believe he meant the passion and joie de vivre, and he linked it to the spice and originality for which the family’s culture was known. It was a wonderful metaphor for what was going on in the family, and showed how the family had to in a sense “come back to their first love” if they were to continue serving their local community. More seriously, though, I can’t imagine a life without God’s grace. Grace is a used and misused phrase in our culture, but when Tim challenged me to write about it, I started getting the passion to look into it. Because my slightly flippant comment holds a weightier truth. I am no theologian, but I have been thinking on the importance of grace to balance truth and vice versa. There is a tendency for us mortals to overemphasize truth at the expense of grace, or to overemphasize grace to the loss of truth. We need truth, but Jesus is defined as full of both grace and truth. God defines Himself as love, so we could say Christlike love is the epitome of grace and truth. In my musings, I have concluded that this is why love can be tough, and why love is never harsh; but rather kind. When I know I am loved by God, I am free to be both truthful and gracious. One does not cancel out the other, and both are necessary. But what does this have to do with grace? Isn’t love a separate concept from grace? Not exactly. God’s lovingkindness, as translated from a word for grace in the Old Testament, shares beautiful overlap with the love of God. God, who defines Himself as love through John in the New Testament, reveals Himself as a God of lovingkindness: way before the Cross. The Greek word for grace in the New Testament has a nuance of lovingkindness, and points to God doing for us what we cannot do for ourselves. I have interacted with many believers online, and I find that a common problem is that we tend towards an imbalance of grace or truth. Our culture talks about grace but gives harsh “reality” to people, without love nor kindness. I think Christians are different; we have the love and kindness of the God of the Bible, and so we can share that in how we speak truth and non-verbally interact with one another graciously, whether in person or not. God’s lovingkindness, like a spice, flavors how we communicate truth in love. I love cinnamon. I think it is as close to heavenly as a spice can be. But try eating it without sugar sometime, or baking without a speck of salt, and you might get my meaning. The flavor of grace is enhanced by all the other attributes of God’s character that He calls his people to emulate. It’s a balance, and though some of us are more cinnamon, and others are more bananas, we are all necessary for the recipe. God’s lovingkindness is something to celebrate, even if something as simple as cinnamon reminds us of it. And I hope never to make banana bread without the love. Melody identifies herself as an adult third culture kid (ATCK) having grown up in the United Kingdom as a missionary kid after being born in Ohio, USA. 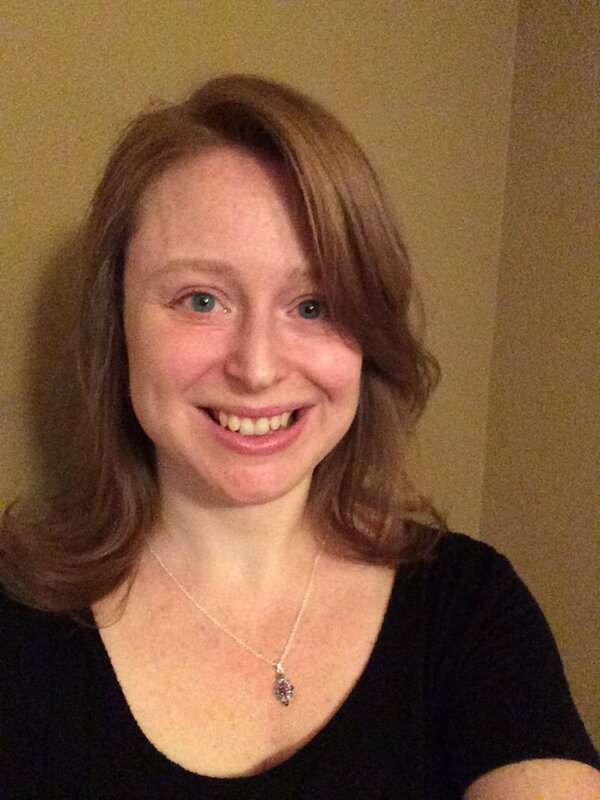 Melody enjoys social networking around a variety of interests from controversial topics such as religion to more light-hearted topics like how preciously sweet children are. She reads more blogs than she writes, tries to maintain some French and German, and is currently pursuing a Masters of Strategic Communication. 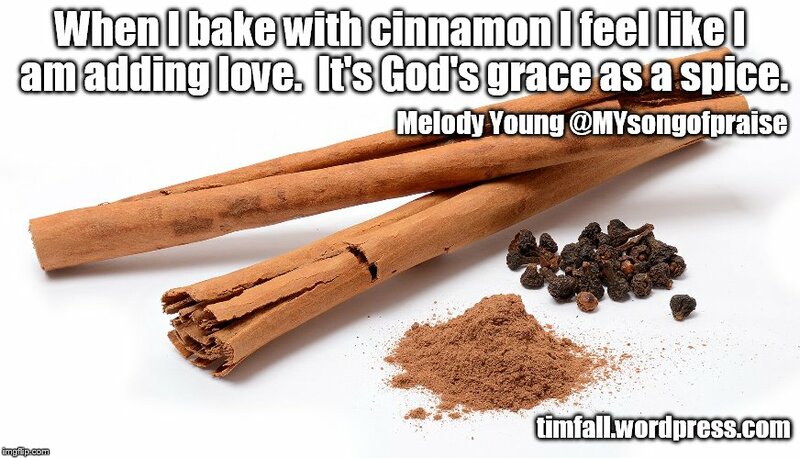 This entry was posted in Guest Post and tagged Baking, Cinnamon, God's grace, Melody Young. Bookmark the permalink. Exactly! This is what God’s love does. It frees us and allows us to do things we couldn’t do without it. I want to be like Jesus, the one in whom all grace and truth finds its beginning. I appreciate this post very much, Melody. I’ve always struggled to fully understand the grace-truth relationship. I like your point that “Christlike love is the epitome of grace and truth,” and that when we deeply know ourselves to be loved by God, we’re free to be gracious AND truthful. I love how you say we’re FREE to be that way — not forced or obliged to, but free to. “There is a tendency for us mortals to overemphasize truth at the expense of grace, or to overemphasize grace to the loss of truth. How we stress one thing/issue over another amounts to avoidable problems. For without balance one will fall. -Remember, pain hurts.